Kenneth Landrieu is the 54-year-old first cousin of New Orleans’ Mayor, Mitch Landrieu. And apparently he’s got road rage. Just this morning, he was convicted of aggravated assault with a firearm – which is a felony – in Orleans Criminal District Court by a six-person jury. Back in 2015, he “forced” the victim (a film industry set decorator, Joseph Harris) to pull over in the Lower Garden District near the HiVolt coffee shop, according to The Advocate. Landrieu stated that he did so after Harris almost hit his car in passing on Magazine Street. The victim claims that Landrieu was red in the face with anger, then pulled out a gun and “threatened to call his ‘boys’ to have Harris arrested.” Landrieu is a reserve Orleans Parish Sheriff’s Office Deputy, so by referring to his “boys” he meant the other sheriff’s deputies. His lawyer asserts that he acted within his rights by pulling the man over. But pulling out a gun? Probably not so much. Harris said he went “full submission” in order to keep Landrieu from doing anything else too rash, which apparently worked because Landrieu left the scene without causing anyone physical harm. The Advocate reports that he then drove off in the baby-blue Cadillac DeVille that belongs to his mother Phyllis, who is the sister-in-law of former New Orleans Mayor Moon Landrieu (Mitch’s father). Landrieu’s team of defense lawyers challenged whether or not the victim was truly fearful of his life when Landrieu pulled the gun on him that day. If he hadn’t been, Landrieu couldn’t have been convicted, but Harris confirmed in his testimony that he really thought he might have gotten shot. And apparently this altercation has had a lasting effect on the victim: “This guy occupies a space in my mind that he never deserved. I’ve gone to therapy over it … I don’t know what this guy’s capable of,” he said. The criminal suit may be over, but Harris filed a civil suit against Landrieu, as well. 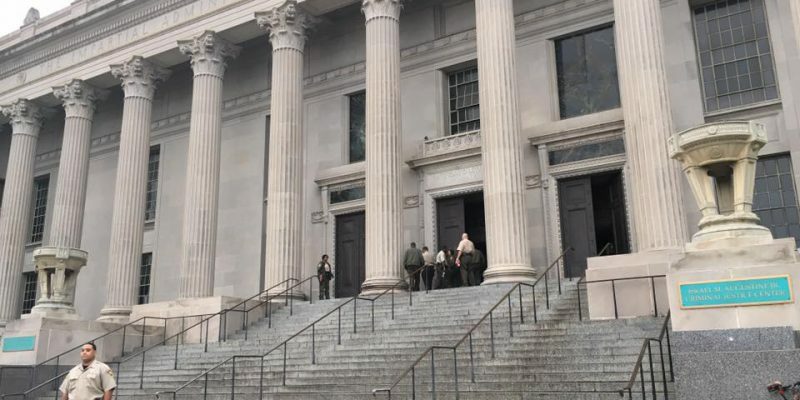 In the mean time, NOLA.com reports that Criminal District Judge Byron C. Williams ordered that Landrieu be placed immediately in the Orleans Justice Center jail until a scheduled hearing to set his sentencing bond.